The Lucky One, I Love Oranges! it sounds like he thought he was reading classic literature, something that might of won the Warwick Prize for Writing, or some other lofty award. 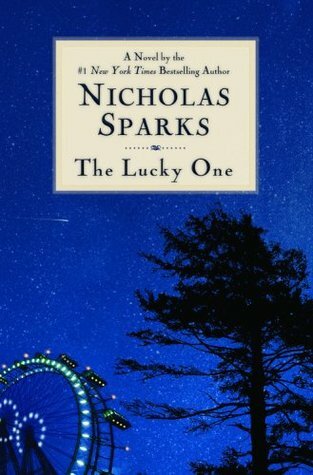 If that was what The Lucky One was, than I would totally agree with his assessment of the book. The problem? That’s an apple, a shining piece of literary work, suitable for English class dissection and to be hallowed as a classic for generations to come. It’s not Pride and Prejudice, it’s a romance novel. It’s an orange, which I thoroughly enjoy. I do not expect my oranges to taste like apples, my Aerosmith to sound like Mozart, or my romance novels to have any literary merit. In my opinion, romance novels are not supposed to be very realistic, real-life isn’t romantic, that’s why some of us read this stuff. It’s an escapee from reality, like a grown-up fairy tale. Handsome guy woos damsel in distress, toss in over the top lines and a quirky additional character or two, stir and voila, romance novel. Each one should be a little unique, sure but they are supposed to be fun, light, a little unrealistic, something you can read in the park or the carpool, or the bathtub. I think this guy really needs to lighten up, no movie with Zac Efron in it is based on any apple, they are oranges and I enjoy citrus, thank-you-very-much. Will you be seeing the movie The Lucky One? Have you read the book? If you have seen or read either what did you think?